Identification of B-cell epitopes in target antigens is one of the most crucial steps for epitopebased vaccine development, immunodiagnostic tests, antibody production, and disease diagnosis and therapy. Experimental methods for B-cell epitope mapping are time consuming, costly and labor intensive; in the meantime, various in-silico methods are proposed to predict both linear and conformational B-cell epitopes. The accurate identification of B-cell epitopes presents major challenges for immunoinformaticians. In this paper, we have comprehensively reviewed in-silico methods for B-cell epitope identification. The aim of this review is to stimulate the development of better tools which could improve the identification of B-cell epitopes, and further for the development of therapeutic antibodies and diagnostic tools. Keywords: Epitope prediction, Linear epitope, Conformational epitope, BCR, B-cell, Epitope. Keywords:Epitope prediction, Linear epitope, Conformational epitope, BCR, B-cell, Epitope. Abstract:Identification of B-cell epitopes in target antigens is one of the most crucial steps for epitopebased vaccine development, immunodiagnostic tests, antibody production, and disease diagnosis and therapy. 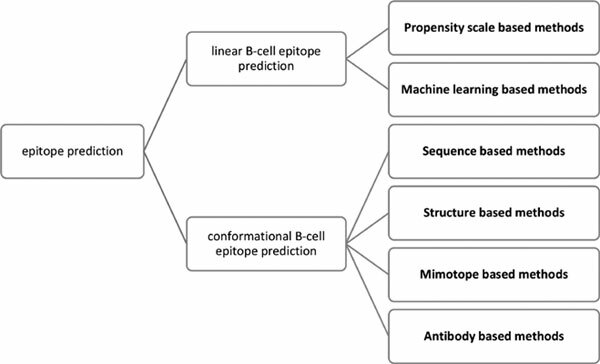 Experimental methods for B-cell epitope mapping are time consuming, costly and labor intensive; in the meantime, various in-silico methods are proposed to predict both linear and conformational B-cell epitopes. The accurate identification of B-cell epitopes presents major challenges for immunoinformaticians. In this paper, we have comprehensively reviewed in-silico methods for B-cell epitope identification. The aim of this review is to stimulate the development of better tools which could improve the identification of B-cell epitopes, and further for the development of therapeutic antibodies and diagnostic tools.